It took almost five years, but a derelict house in the 6300 block of Charles Page Boulevard, which had because a health and safety hazard, is gone. J.D. Smith, Charles Page Neighborhood Association president, said the group started lobbying government agencies in August, 2006. Smith said the house was originally built for an official of the Sand Springs Home in the 1920s. At first, the group approached the City of Tulsa only to find out the property was in an unincorporated part of Tulsa County. Then the group found out the county did not have the authority to condemn the unplatted piece of property. “County Commissioner Karen Keith had them change the law so the county had the authority,” Smith said. Tulsa County and the Tulsa City-County Health Department both worked on the project. 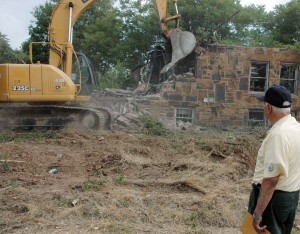 Cherokee Pride Construction was selected to do the demolition and site cleanup work at a cost of $46,000.00. The project is being paid for by an Urban County Community Development Block Grant coordinated by INCOG (Indian Nations Council of Governments), officials said. In addition to the demolition, Tulsa County will sponsor a fall cleanup effort to allow area residents to clear debris that has accumulated over time. Flyers will be distributed by the County announcing the time of the cleanup and location of the dumpsters, Michael Willis, county spokesman, said.